Pain Solution is a performance art group based in Oslo, Norway. The group was founded in 1993 by Håvve Fjell, and has seen several members come and go. Presently, Håvve performs alone. 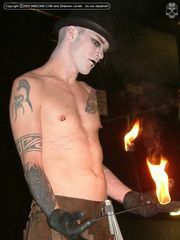 The Pain Solution show features Fakir-style acts along with modern body modification practices, seamlessly set to music. The things you can expect to see include breathing and eating fire, standing on a bed of nails, walking on broken glass, play piercing, pulling, suspension, playing around with chains, knives and even an angle grinder. Pain Solution have performed all around the world, including BMEfest 2005. The early history of Pain Solution can be found in the book Ten Years of Pain. This page was last modified on 29 September 2011, at 04:04.